The development of the Henry Hotel began c. 1919 with the formation of a company by J.E. Howard and A.D. Whittington. 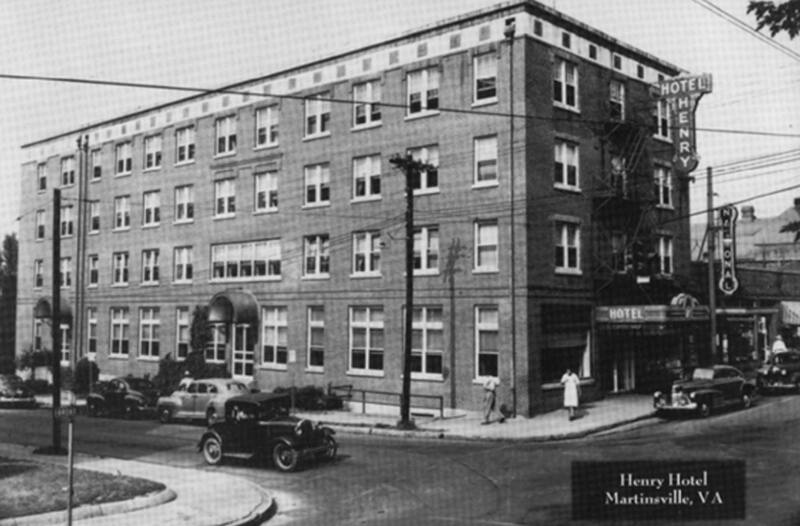 Actually constructed in 1921, the Henry Hotel was designed to offer the city of Martinsville a modern hotel capable of accommodating the city’s significant growth in population and economic activity. Located at the southwest corner of East Church and Broad streets, the Henry Hotel served as a cornerstone to the rapidly expanding commercial district of Martinsville. Howard and Whitten recognized the need for an up-to-date hotel facility that would reflect the growth and prosperity of the city in the early 20th century. The Hotel, with its convenient location, spacious lobby, and elegant dining room served as the host to visiting politicians and businessmen as well as the local citizens. Several civic organizations, including the Kiwanis Club, Lions Club, and Retail Merchants Association used the hotel as their meeting place. After surviving the hardships of the depression, the hotel fell on hard times in the mid-20th century as travel and social customs changed. With the coming of the interstate and the introduction of motels, the hotel lost much of its clientele. After converting part of the lobby along Church Street to commercial retail space and converting the dining room into offices, the hotel closed in 1967. The Hotel Henry retains its historic fabric and as such, it is a contributing structure in the Martinsville Historic District, and is listed on the National Register of Historic Places.